This workshop focuses on the design process for mobile learning. It will include the essential elements of designing mobile content with an emphasis on creating user experiences and interaction in learning. Participants will be provided with examples to explore how to adapt print-based materials into mobile content that is simple, engaging, and highly effective. Participants are suggested to bring their own iPad devices so that they can download and explore the features and usability of the mobile apps developed by the OUHK. This workshop will introduce the ten-step process for open textbook creation and adoption pioneered in the state of Utah, USA. From identifying faculty and OER, to professional development, to the materials review process, this workshop provides an overview of how to create and adopt open science textbooks. See the whitepaper at http://www.lumenlearning.com/whitepapers. This technical workshop focuses on the current issues faced by the academic community, especially in Open and Distance Learning (ODL), with respect to searching for credible, relevant and academically useful open educational resources (OER). The workshop will cover four key aspects: (1) the current OER search dilemma; (2) the concept of metadata; (3) existing search methods; and (4) useful OER search tools. Among the topics covered will be the current problem within the context of OER search, the limitations of Google and native search mechanisms, federated search, semantic search, metadata standards and some large-scale solutions to the OER search dilemma. The last part of the workshop will introduce the OERScout search framework which uses text mining techniques and faceted search to recommend Desirable OER for teaching and learning. Massively open online courses (MOOC) have been popular in recent years. While this course format may be flexible and efficient in science and engineering subjects, its effectiveness in the humanities, in which learning outcomes, and assessment criteria, are hard to standardise, is controversial. The speaker has been working on a humanities MOOC (Classics of Chinese Humanities: Guided Readings by Prof. Lee Ou-Fan Leo) at the Chinese University of Hong Kong, and he will discuss the challenges encountered during the building of the course in his presentation. 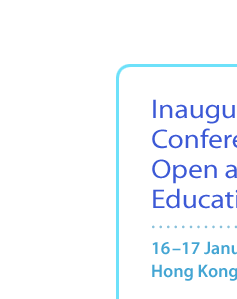 Presentation outline: The presentation will start with a brief introduction to open educational resources, particularly open textbooks, and how different countries around the world are developing and using open textbooks for learning and teaching at reduced cost. There will be a demonstration of various open textbook systems around the world, and how they are used by teachers, students and the general public. The presenter will then describe the Open Textbooks for Hong Kong project, which is an online collaborative environment containing open source textbooks which are free, flexible, current and directly available for use, adaptation and distribution by schools. The progress of the project will be reported, and the plan for the establishment of a consortium of open textbooks will be revealed. Some sample textbooks will be distributed during the workshop. The ways in which the system will be sustained in future will also be discussed. Benefits to audience: The audience will be introduced to the novel concept of adopting open textbooks in the Hong Kong classroom, which is an alternative to traditional textbooks published by commercial publishers. Participants will be led to access an abundance of open educational resources and open textbooks already available on the Internet for adoption and adaptation in their daily learning and teaching. They will also be shown the Open Textbooks for Hong Kong project, which teachers will find of interest.